: A versatile gun dog that must be able to work in the field, forest and water, having the following typical qualities an excellent nose, firmness on the point, excellent retrieves and determination to remain on the scent even when swimming, which he manifestly enjoys. He copes with difficult terrain as well as extreme weather conditions. Because of his easy going nature and his adaptability, he can easily be kept as a companion dog in the house. : Mrs. H. Gross-Richardson and Mrs. Ann Mitchell, ANKC Australia and Mrs. Elke Peper. 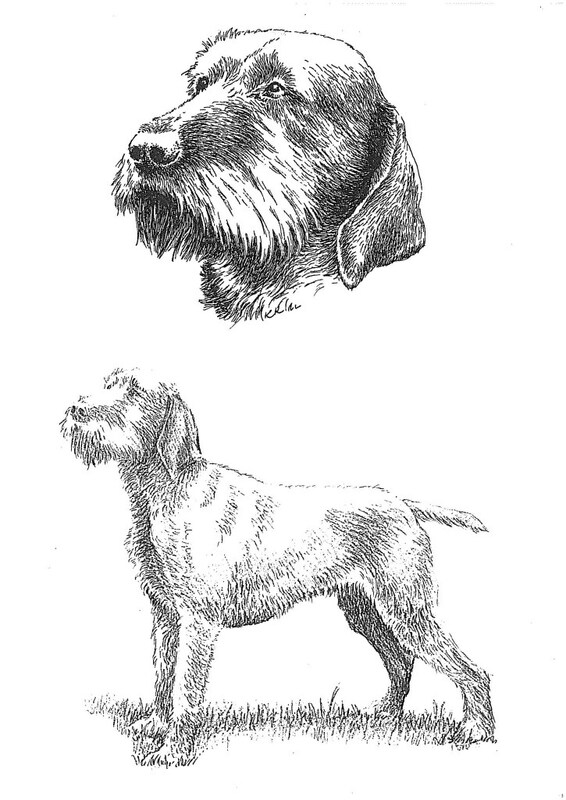 : The Hungarian Wire-Haired Vizsla was created by cross-breeding the Hungarian Short-Haired Vizsla with the German Wire-Haired Pointer during the 1930‘s. His breed characteristics are identical with those of the Hungarian Short-Haired Vizsla. : A lively, russet gold hunting dog of dry and lean but more robust construction compared to the Hungarian Short-Haired Vizsla. His appearance embodies his qualities as a multi-purpose pointing dog, endurance, working ability and an easily satisfied nature. : An affectionate and intelligent dog, selfconfident, easily trained, which cannot bear rough treatment. He keeps contact with his handler, is passionate in his quest, is stubborn, has a good nose and is staunch on the point. : Moderately wide, slightly domed. A slightly pronounced groove runs from the moderately developed occiput towards the stop. The superciliary ridges are moderately developed. : Broad and well developed with nostrils as wide as possible. The colour of the nose harmonises in a dark shading with the coat colour. : Tightly fitting, no pendulous flews. : Powerful jaws with a perfect, regular and complete scissors bite, the upper teeth closely overlapping the lower teeth and set square to the jaws; with 42 healthy teeth according to the dentition formula. : Slightly oval, of medium size, well fitting eyelids. Intelligent and lively expression. The brown eye colour harmonising with the coat colour, as dark as possible preferred. : Set on at medium height, a little backwards, hanging closely to the cheeks, ending in a rounded V shape. Slightly shorter than those of the Hungarian Short-Haired Vizsla. : Of medium length, harmonising with the overall appearance. The nape very muscular and slightly arched. Tightly fitting skin at the throat. : Solid, well muscled, taut and straight. The vertebral spines should be hidden by the muscles. : Short, broad, tight, muscular, straight or slightly arched. The loin is well attached. : Broad and of sufficient length, not cut off short, sloping slightly to the tail. Well muscled. : Deep and broad with well developed well muscled and moderately arched forechest, sternum extending as well back as possible. The sternum and the elbows should be at the same level. Last ribs moderately arched. Ribs carried well back. : Elegant, tight, arching towards the rear, slightly tucked up. : Set on at medium height, strong at the base, then tapering. In countries where tail docking is not prohibited by law, the tail may be shortened by one quarter to avoid hunting hazards. If the tail docking is prohibited, the tail reaches down to the hock joint and is carried straight or slightly sabre like. On the move, it is raised up to the horizontal. The tail is well furnished with dense coat. : Viewed from the front, straight and parallel. Viewed from the side, legs vertical and placed well under the body. Good bone, well muscled. : Long, sloping and flat, well attached shoulder blade. Elastic when moving. Strong, dry muscles. Well angulated between shoulder blade and upper arm. : Close to the body, however not tied in, turning neither in nor out. Well angulated between upper arm and forearm. : Long, straight, sufficiently muscled. Bones strong, but not coarse. : Pastern joint: Dry, sinewy. : Slightly oval, with well knit, sufficiently arched, strong toes. Strong brown nails. Tough, resistant, slate grey pads. The feet are parallel when standing or moving. : Viewed from behind, straight and parallel. Good angulations. Strong bone. : Long and muscular. Good angulation between pelvis and upper thigh. : Long, muscular and sinewy. Its length is almost equal to that of the upper thigh. Good angulation between lower thigh and metatarsus. : Strong, dry and sinewy, rather well let down. : Vertical, short and strong. : The typical gait is an animated, light-footed trot, elegant and far reaching, with much drive and corresponding reach. Not exhausting gallop when working in the field. The back is firm and the topline remains level. Pacing is undesirable. : Tightly fitting, without folds. The skin is well pigmented. : Various shades of russet gold and dark sandy gold (semmelgelb). The leathers may be a little darker, otherwise uniform in colour. Red, brownish, light yellow or lightened colour shadings are undesirable. A little white patch on the chest or at the throat, not more than 5 cm in diameter, as well as white markings on the toes, are not considered faulty. The colour of the lips and of the eyerims corresponds to the colour of the nose.